Can food supplements and herbs be used as natural remedies for ADHD? Parents who are aware of the side effects of medication are constantly on the lookout for the best natural treatments for their children. Unfortunately, this question cannot be answered by a simple "yes" or "no." Every child is biochemically unique, which means that he or she will have a different response to different treatments. One child might experience reduced symptoms after taking one herbal remedy while the next child may show no improvement at all. Lately, a lot of experts recommend using spirulina as an ADHD natural remedy because of its wide spectrum of benefits. Spirulina is a blue-green algae with an extensive nutritional profile. 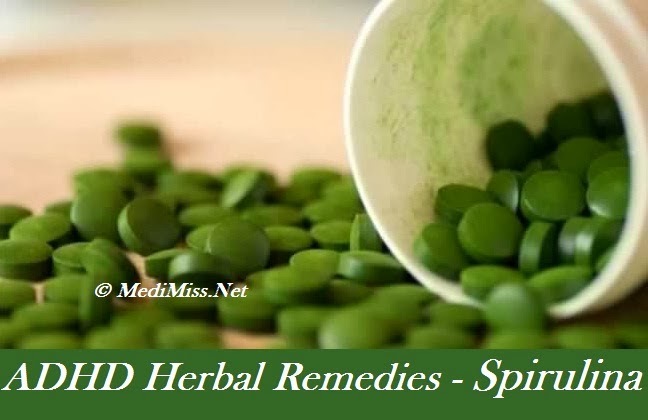 In fact, some experts say that spirulina alone offers more nutritional benefits than most foods, and can replace expensive multivitamin formulas. If you look at spirulina's nutritional offerings and compare them to the nutrition deficits suffered by children with ADHD, you'll see why this algae has so much potential to be a natural treatment for ADHD. Spirulina is rich in ten non-essential amino acids, eight essential amino acids, and even essential fatty acids needed by the brain. It has a rare essential fatty acid called GLA, which can only be found in human milk and evening primrose. Pound for pound, spirulina provides 200 times more protein than beef and 20 times more protein than soybeans. And if you're searching for a multivitamin formula that can treat the vitamin and mineral deficiencies found in children with ADHD, spirulina might answer your child's nutritional needs. Spirulina contains a host of minerals like iron, zinc, potassium, magnesium, calcium, and vitamins B6 and B12. There's no need to give your child antioxidants, either, because spirulina contains vitamins E and C, two natural antioxidants that protect vitamins and minerals from free radical damage. Aside from being a potent source of vitamins, minerals, and amino acids, spirulina has natural detoxification properties. In many cases, high levels of lead, mercury, and other neurotoxins are responsible for the ADHD symptoms in children. There is some evidence that spirulina can increase the efficiency of detoxification and reduce the amount of toxins on kidneys. Although there are no studies that investigate spirulina's effects in treating ADHD, its nutritional content shows that it could be an important source of nutrients needed to manage the disorder. For instance, a number of studies show that zinc supplements can correct ADHD symptoms triggered by a zinc deficiency. One clinical trial observed that spirulina is more effective than zinc sulfate supplements in boosting zinc levels. Since spirulina is fairly new to consumers of natural medicine, experts have yet to determine the recommended dosage of spirulina for children. However, you can include it in your child's diet by adding spirulina flakes to soups, sauces, and salads. Make sure you consult a qualified holistic health care practitioner before you use spirulina or any natural treatments for ADHD.